At Goofy Foot Surf School we feel it is a privilege to teach surfing. 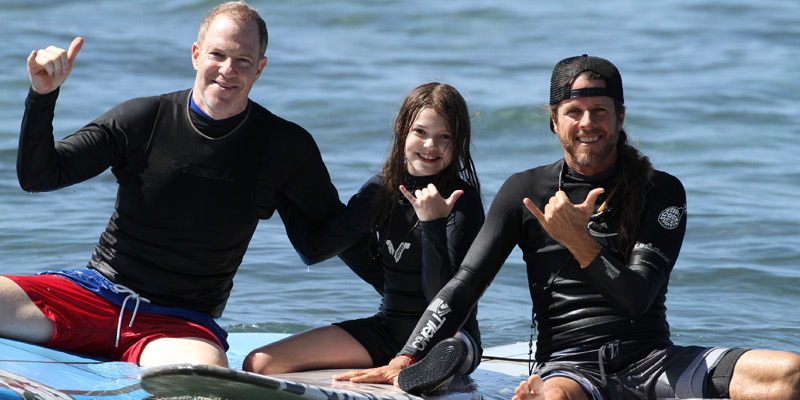 Our primary focus is on giving each student the best and safest surfing experience possible. It is our responsibility to professionally teach the skills of surfing and instill in students a healthy respect and awareness of the beauty and power of Mother Ocean. Let Goofy Foot Surf School introduce you to the best surfing experience on Maui! Goofy Foot makes the seemingly difficult remarkably easy! Whether you’re interested in learning to surf for the once in a lifetime experience or you’re a sincere “wanna-be surfer”, a 2-hour beginner introductory lesson is all it takes to learn the basic fundamentals of surfing and riding waves. We guarantee that you will stand and ride at least one wave in your first 2-hour lesson or it’s free! Our introductory lesson focuses on giving the beginner surfer an easy approach focused on safety, fundamentals, and ocean-awareness. 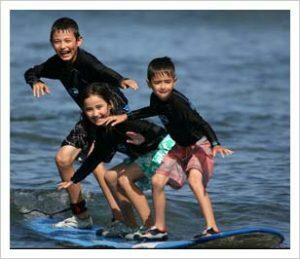 Goofy Foot’s lessons are based on easily learned instructions for paddling, navigating the surf zone, timing and catching waves, four fundamental surf stances, board maneuvering, stopping, and even wiping out. Goofy Foot will provide patient professional instruction, excellent equipment, and the best waves possible for learning. Beginner group lessons are available to virtually everyone, and there are very few limitations when considering the age (must be 9 yrs of age or older to join a Group Lesson, otherwise Private lessons are required), weight, height, or swimming ability of the potential surfing student. Prior ocean experience is not necessary. Group classes are small in size, no more than 5 students per Instructor. Guaranteed! As a first step in their beginner group lesson, our students are outfitted with modern soft longboards, surfing booties, and a protective lycra t-shirt. Next we proceed to the beach, where the first half hour or so of your lesson is taught on the sand and in the flat water. The rest of your time is spent surfing in the warm water. Students are supervised and coached at all times! Through years of experience, we know a good beach lesson almost always translates into a good water lesson. Easily over 30% of our students stand up on their first wave.The first half-hour of the beginner lesson is spent on the beautiful beach and in warm waters of the reef-protected lagoon out in front of our shop in Lahaina. The surf break is a short paddle or walk from there. On the beach, students learn and practice Goofy Foot’s easy approach to learning to surf that is based on four fundamental stances and introduces easy methods for paddling, navigating the surf zone, timing and catching waves, standing up, board maneuvering, stopping, and even wiping out. As safety is paramount, our instructors instill in students the concepts of “360 degrees of awareness” and “constant anticipation” which are vital to safe participation in surfing. The beach lesson also gives students and instructors time to develop a rapport and a chance to go over rules of the road, our coaching voice and hand signals, and any questions before their surfing session. After their initial half hour of training, students spend the remainder of their time surfing with their instructor and are professionally coached and supervised at all times. At the beginning of the day the primary instructor sets a buoy near to the surf break that students use as a reference point for navigation and to mark the resting area. The instructor paddles with students to the buoy and instructs them on maintaining their position in a moving body of water. At that point the students work on a rotation with one or two students paddling over to their instructor to prepare to catch their first wave. Students begin in small surf and progress according to their own abilities. After their ride they are instructed to paddle back to the rest area to await their next turn. Surfing and paddling in this method helps orientate students to any ocean currents and to the surf zone. The instructor is responsible for every aspect of maintaining this rotation with students until each student displays a sufficient grasp of the basics and feels comfortable in the waves. At this point, with instructor approval, students are given more freedom to surf on their own and the instructor continues to facilitate students throughout the duration of the lesson. The goal of the instructors is to divide time evenly among all students and to ensure that everyone stays safe and gets at least one successful ride standing. The large majority get a great many successful rides. At the end of the lesson the instructor remains in the water until students have made their way to the beach. Students are awarded Beginner Surfer Diplomas and an opportunity to put their thoughts on surfing in our logbook. Students are informed about opportunities for continuation lessons, mentor programs, day camps, surf safaris, rentals, and other positive stuff like our Goofy Foot logo wear! 2-HOUR INTRO-BEGINNER, BEGINNER, ADVANCED-BEGINNER, & INTERMEDIATE PRIVATE LESSONS. FOR BEGINNERS TO ADVANCED SURFERS!! Private lessons offer students the perfect opportunity to take advantage of the undivided attention from one of our professional surfing instructors! Take advantage of your time and our years of teaching experience. Instruction is focused with an aim to provide ideal learning conditions for aspiring individuals. A private lesson will really help you take your surfing to the next level, plus it will do wonders to increase your wave count! As a first step in all our lessons, students are outfitted with modern soft longboards, surfing booties, and a protective lycra t-shirt. Next we proceed to the beach, where the first half hour or so of your lesson is taught on the sand and in the flat water. The rest of your time is spent surfing in the warm water. Students are supervised and coached at all times! Upon graduation, students are awarded a Beginner Surfer Diploma and a Goofy Foot Surf School sticker. We keep it low-pressure, safe and fun! All of our instructors are highly trained and experienced professionals who love what they do. Since 1994 we have successfully taught approximately 100,000 surfing students! We are thorough with fundamentals, awareness, and safety. All instructors are First Aid/ CPR and CORA certified. Surf Camps are open to everyone and encouraged for the keen individual or small groups. Instruction is geared primarily towards introductory-beginner through advanced-intermediate levels. Each student’s skill and experience level will be catered to in terms of appropriate guidance and instruction. Goofy Foot Surf Camps are 100% supervised by one of our hand-picked and highly trained instructors both in and out of the water for the entire span of the surf camp session. Instructors are patient, mature and experienced professionals who love what they do. Guests are provided with all their surfing gear. Surf Camps allow more time for students to receive in-depth instruction in the areas of ocean awareness, tides, swells, waves, currents, and reefs. We guarantee our camps will be fun, educational and take your surfing to the next level! Students begin their day with warm up stretching and surfing instruction on the beach. The rest of the morning session is spent in the warm, beautiful water surfing and practicing skills with the professional instructor. Lunch is included and is served at a terrific beach side restaurant just a few steps away from our shop headquarters. After lunch comes a rest and a talk on the history and evolution of surfing. The afternoon session will focus on progressing student’s surfing skills and awareness. Students are always encouraged to surf and take rest breaks at their own pace. Students learn to surf with a great degree of success which we attribute to the highly developed teaching techniques and surfing fundamentals we offer. WeThe great majority of the time, Goofy Foot instructors teach while riding a Softop Longboard. Since 1994 this has been a distinguishing feature of owner/founder Tim Sherer’s style of teaching and still is ongoing today at Goofy Foot. 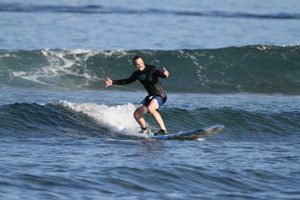 When done skillfully, teaching from a board can facilitate a much more safe, comprehensive, and expansive learn-to-surf experience than a style of instruction where the instructor stands stationary and pushes students into waves. 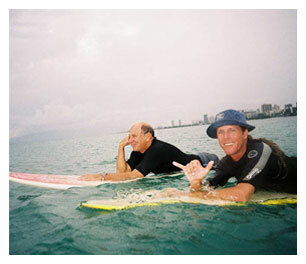 Some of the most important advantages of teaching from a board include; the potential to surf or paddle to a student as fast as is possible, the ability to perform demonstrations and to surf the same wave with a student to provide up close coaching, as well as enabling the instructor to paddle around the surf zone with the student to provide maximum potential guidance. Depending on their level of experience, students will begin their day with an introduction or review of the fundamentals of surfing and ocean safety as well as some warm up stretching. Surf Camps are great in that they allow more time for students to receive in-depth instruction in the areas of ocean awareness, tides, swells, waves, currents, and reefs. The experience we have gained from teaching surfing since 1994 has taught us that a great beach lesson translates into a great water lesson. The first half-hour of surf camp is spent on the sand and in the warm water of the reef-protected lagoon beachside of our shop in Lahaina. The surf break is a quick paddle from there. On the beach, students learn and practice an easy approach that is based on four fundamental stances and three proven ways to stand up and stay up in white water and open-faced waves. We will introduce easy methods for paddling, navigating the surf zone, timing and catching waves, control, regaining balance, maneuvers, emergency stopping, and even wiping out. Learning safety is paramount and our instructors instill in students the concepts of “360 degrees of awareness” and “constant readiness”. Both are vital to safe participation in surfing and always helpful for living life. Beach time is important to give students and instructors a chance to warm up, develop rapport, and go over voice and hand signals together. Instructors will advise students of the day’s prevailing conditions and go over rules-of-the-road and cautions related to our specific Hawaiian reef break before their surfing session. They will also address any questions or concerns of students. 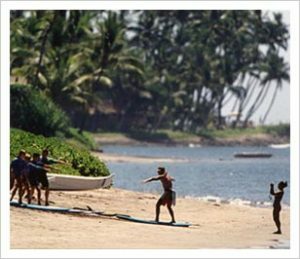 Surfing, playing and learning in the same royal surfing grounds of the ancient Hawaiian Capital of Lahaina, where King Kamehameha III himself rode waves, is where students and instructors spend most of their time. Each morning we set up a small red buoy-ball near to the surf break as a fixed, easy-to-see reference point for navigation. This buoy marks the areas of the surf zone where there is minimal wave action, where students are able to rest or just watch in general calmness with relaxed awareness. The instructor will paddle with students to the buoy and give directions on maintaining a position in a moving body of water and illustrate any prevailing currents. At that point, students work on a rotation from the buoy. One or two at a time will paddle with their instructor to the inner wave zone to prepare to catch their first rides. Students begin in small surf and progress according to their own abilities. After each ride they are instructed to paddle back to the buoy before heading back out to their instructor for more fun. Paddling and surfing in this manner helps to orientate students to any ocean currents and to navigating safely in and around the surf zone. Goofy Foot instructors are responsible for every aspect of maintaining this rotation with students until each student displays a sufficient grasp of the basics and displays a necessary level of comfort, understanding, and ability in the wave environment. At this point, with instructor approval, students are given more freedom to surf on their own as instructors continue to supervise and facilitate throughout the duration of surf camp. Instructors aim to divide time evenly among all students and to ensure that everyone stays safe, has fun, and exceeds their goals. The morning session generally last 3 hours or until students are ready to break for lunch. For the full-day surf camp, the afternoon session will reinforce what students learned and practiced that morning. We will proceed to introduce intermediate or advanced skills and focus on taking students to the next level and to possibly bigger waves. We have over eighty surfboards to choose from and will match the right board to each student’s ability and desire for style and optimal success. Lunch time is for eating good, resting, relaxing and learning a bit about the 1000-year history and evolution of the art form/sport of surfing. Facilities also include a freshwater shower, changing room, private bathrooms, safe storage for your gear, pro photography, and video viewing equipment. Multiple day sessions are available, discounted and definitely recommended for your surfing! Call for Availability. If Tim is not available, we can arrange private lessons with our senior instructors. Founder, resident master instructor and “stoke broker” Tim Sherer has personally taught tens of thousands of surfing students. He holds certifications from the Maui Red Cross in CPR, 1st Aid and Lifeguard Training. A formal education and a relationship with the ocean have been ongoing parts of his life since early childhood. His joy and enthusiasm for both have earned him a university degree and a resume rich with surfing experiences from around the globe. Tim has much to offer aspiring students. His approach to teaching is very positive, patient and adaptable towards the needs of each individual. The goals and concerns of our students, their safety, fun and learning are primary priorities! If you are interested in improving your surfing skills, expanding your surfing horizons, Tim’s depth of experience and reputation in the field make him an unparalleled choice for your surfing instruction. A lesson with Tim can help you to take your skills to the next level!